The diagram below gives an overview of the outcome of our discussions with stakeholders in Zambia. This was the starting point for the development of a plan for a pilot of the ColaLife concept in Zambia. There is also a slidecast below with an audio soundtrack which builds the diagram up step by step and explains each stage. To watch this and listen to the explanation just click on the Play Button. How is this idea safeguarding against pilfering of the Aidpod(and that then being sold on by pilferer)? Thanks for your comment. 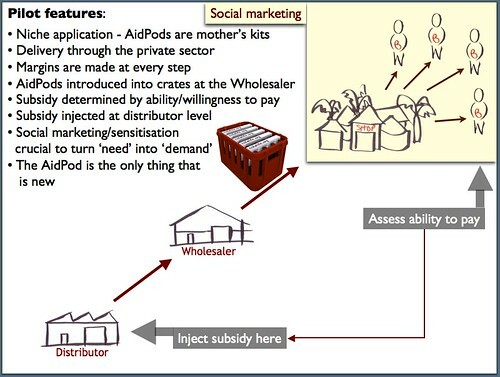 Because the AidPod is a commodity, just like Coca-Cola, so the wholesalers have to buy it and so do the retailers. This means that they look after it. If they lose it or it gets stolen then it’s their loss. Of course it could still get stolen but unlike in the public sector where theft doesn’t directly impact on an individual, pilfering is less likely. This is an awesome cause! Are they selling these packages to the people in zambia or just giving them away? Coca-Cola have no operational role in what we are doing they have just advised us on how to create what is a called ‘a value chain’ to get our product to the same places that Coca-Cola gets to. We do use the Coca-Cola wholesalers in the districts we operate in but these are independent, general wholesalers and so sell other things, not just Coke. 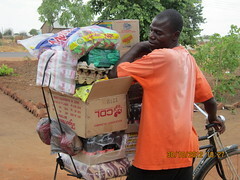 Our kits are being sold through micro-retailers in remote rural areas. Everybody involved in the value chain makes a small profit. ColaLife is an NGO and doesn’t make a profit. Our role is to create the value chain and then leave those involved to get on with it. Can you say a little more about how you establish ability/willingness to pay? Is it looked at nationally, regionally or purely locally? As a corollary, how do you prevent product diversion so that wholesales/distributors take the maximum subsidy by buying from you in an area with a low ability to pay and then divert the product into an area with a higher ability to pay, selling at a higher price? How do you prevent excessive markups being applied through the value chain? Are the packs adapted for local languages and for communities with low literacy levels? Thanks for your comment and questions David. Here are some answers for you. – How much do you think the kit is worth? – How much would you pay for a kit? We analysed the responses and came up with a RRP of K5.00 (around USD 1.00). We are currently doing this is remote rural areas and will move on to do it in district towns and peri-urban settings. The demand curves that we generate in this process will inform our scale-up plan. We use vouchers to deliver a subsidy to people in certain (poor rural) areas. 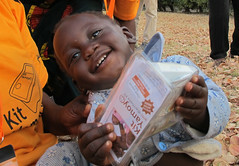 These vouchers are given to mothers and the they can be exchanged for a kit (or 50% of the cost of a kit). The RRP is the same across the country and only retailers in the poor areas can redeem vouchers. We have been able to do this because we have been working in just districts with retailers and wholesalers we have trained. When we move to a national scale-up we don’t expect to be able to ‘control’ the RRP and will probably only have a MSRP and ensure that there is competition (eg multiple retailers in each community). Is Coca Cola mutualizing its supply chain cost with Colalife? or is the company providing this service for free as a non institutional subsidy? Coca-Cola has allowed us to experiment using the space in its crates at no cost. However, it turns out that it’s not the space in the crates that’s important but the space in the market. Please see this blog post. I am a retired Registered Dietitian and tell ALL new moms about ORT. I would tell moms to mix: 1/2 tsp.salt + 1/2 tsp. baking soda + 3 Tbsp. sugar into 16 oz. clean water. which ORT formula you use. Also, has Coca Cola given your NGO a donation? I would hope so! And I will give you a donation via post. P.S. I found out about you via: the NPR Goats and Soda blog. Thanks for your comment. The recommendation now, even for home treatment in developing countries is to use ‘Low Osmolarity ORS’ and there is a WHO/UNICEF standard for this. This is what we use in our kits. However, our focus groups with mothers told us that the standard 1 litre sachet (~20g) was too big – a child will only drink 400ml on average in 24hrs and you’re supposed to throw away what don’t use after that time. So we designed and use a 200ml sachet (~4g) which is now locally produced. These sachets make up a glass full. This is much more convenient. There is no wastage and less chance of contamination. There is lots of discussion on the pros and cons of different types of ORS on the website – just search for ORS. I agree with most mothers over the quantity of ORS intake by children and I think this is job made easier. But have you tried advertising even in Shopping Malls because we have a large number of people coming in and out of these Malls. I work for Manda Hill and i am pretty sure your product would be known faster by everyone that comes to the Mall if Exhibited at our Mall. Give it a try and see the response from the general public because the Mall has ALL kinds of people visiting. Thank you for your comment Martha. We are starting scale-up in Lusaka from Oct-15 (2 months time) and will be looking at opportunities to promote Kit Yamoyo to all mothers (and carers). Could we come and talk to you about how we might promote it in Manda Hill? My email address is simon@colalife.org. Thanks Muluba. I will send you an invitation to our mailing list.